Wanting more from work than just a paycheck or a title. Wishing to integrate personal and spiritual beliefs into one’s working world. Being ready to manifest a work life rooted in joy, purpose and contentment. These are core desires felt by professionals, though they often lack a roadmap. 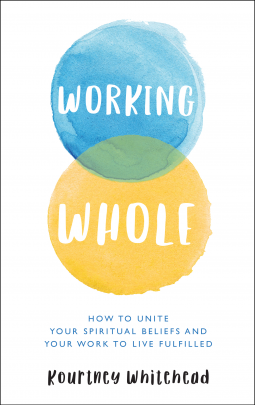 In her book Working Whole, career expert Kourtney Whitehead offers a practical guide to align your work pursuits with your truest desires. She shares eight principles that will free professionals to be inspired and joyful in their life and work callings. She advises that when we commit to living our beliefs in these eight core areas (humility, surrender, discipline, gratitude, connection, love, power and patience), we can work authentically and live fulfilled. Drawn from her career as a recruiter, counselor and coach and her work with everyone from new hires to seasoned executives in transition to high-achievers determining what retirement can mean for them, Kourtney shares tips and tools for handling the expectations, choices, conflicts, challenges and opportunities we face in our work life. She leads readers through a transformative experience to become more creative, energized, observant, accepting of change and open-hearted. With a warm tone and featuring informative content, exploratory and journaling exercises and actionable suggestions throughout, Working Whole provides a clear framework for making life and career decisions, both big and small, allowing readers to reach their highest potential and live their most fulfilled life. I really needed this book. I have often struggled with merging the two parts of me: one ambitious and the other striving to be content, or in the words of the author, "humble." This book was very interactive in that it challenges you to ask questions about your life as it is and how you wish to be. Much like a workbook or study, I spent a lot of time thinking about how to change my current situation (externally) to match my current self (internally). I would recommend this book to any woman wondering how to reconcile the different parts of herself, especially as a devout person reconciling that desire to serve with the desire to succeed.